Throughout the late 1960s and early 70s, the factory Porsche race team was extremely successful with their 908, 917, 917/10 and 917/30 models. However, these larger capacity prototypes were extremely expensive for the small Porsche factory team to build and develop, and, as a result, Porsche did not have a competitive car ready for the new, 1973 endurance championship class being run for 3.0-litre cars. Up against the prototypes such the Ferrari 312, the Matra-Simca MS670, and the Alfa Romeo Tipo 33, the old Porsche 908 and the aerodynamically handicapped 911 had no real chance, so Porsche Racing concentrated it’s efforts on the next generation 911, and it’s development for the upcoming world endurance championship for Group 5 cars. 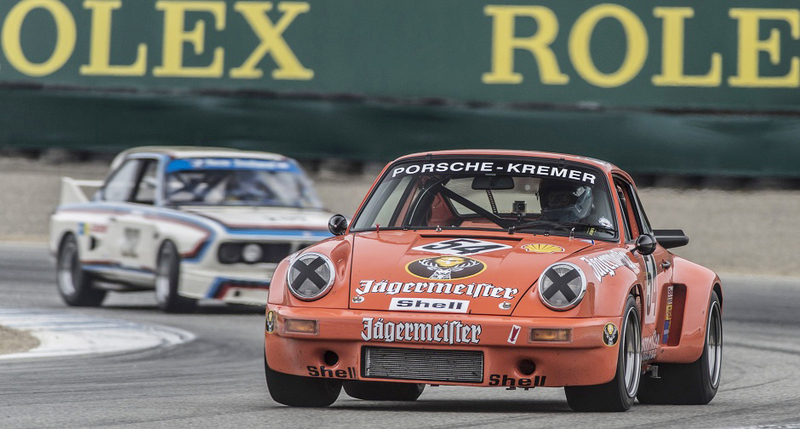 Amazingly, 1973 would however, see two outright victories for a 2.8-litre Porsche RSR in the World Championship for Makes. Peter Gregg and Hurley Haywood took victory at the Daytona 24-hours, and later in the year, the pairing of Herbert Müller and Gijs van Lennep scored an historic win at the Targa Florio race, held on the tortuous, 45-mile circuit that wound its way round the mountains of Sicily. For 1974 Porsche developed a 3.0-litre version of the RSR, and in 1974 and 1975 they built 59 examples of the Carrera RSR racecar that would be sold to privateer race teams while the works were developing the new Group 4 and 5 racecars, the 934 and 935. 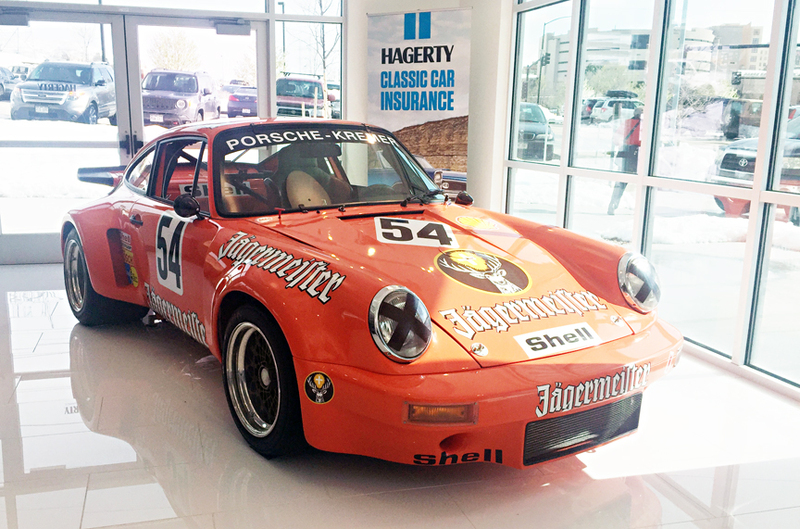 The car on display here is RSR chassis no. 005 0005 (1975, fifth car), amongst the most successful of the RSRs built and raced in that two year period. The bright-orange, Jägermeister sponsored car, designated an RSK (K for Kremer) by the team, may look like any one of those 59 RSRs, but it is actually a very special chassis, one of two cars developed for the 1975 racing season by the famous Kremer brothers, Manfred and Erwin of Porsche Kremer in Cologne, Germany. Built to race in the German Rennsport DRM Championship the three main drivers of the instantly recognisable, bright-orange car were Helmut Kelleners, Hans Heyer, and Bob Wollek. Kelleners drove in all but three of the 19 races the car competed in during 1975, taking one race victory, two second place finishes and three third places. All three drivers were in the car for a hugely significant class win at the Nürburgring 1000km in June, and Heyer also took second at the Nürburgring Super-Sprint race in September. Josef Brambring, who drove the car just the once during 1975, finished third at the final race of the season at Hockenheim. For the 1976 season, 0005 was sold to Edgar Doren, repainted white with red and blue striping, and driven by him throughout the year. He finished the 1976 DRM season in 15th place with 55 points. The car then passed through the hands of several other European teams before being sold and shipped to a US-based owner Charles Slater in 1994. After having owned and raced the car for 18 years, in 2011 Slater decided to end a long and successful relationship and the car moved to a new owner and underwent a full, bare-shell restoration. In 2014 this significantly historic, and now highly-valuable car passed into the ownership of Colorado based collector Andrew Larson. He has raced the car at several Vintage events throughout the country and in September of 2015 the car was seen at Rennsport V with none other than works Porsche driver and winner of the 1977 Le Mans 24-hours, Jürgen Barth behind the wheel.